Prime Minister Theresa May will form the government with informal backing of the Democratic Unionist Party. Prime Minister Theresa May's gamble of calling snap polls spectacularly backfired on Friday with the British electorate delivering a hung Parliament and forcing her to seek the support of a small Northern Irish party for staying in power, as the country braces for hard Brexit talks. May, jolted by the electoral setback, however, remained defiant to calls for her resignation and vowed to form a minority government with the informal backing of the Democratic Unionist Party. "I have just been to see Her Majesty the Queen, and I will now form a government -- a government that can provide certainty and lead Britain forward at this critical time for our country," a grim-faced May said in a statement delivered outside 10 Downing Street. "This will allow us to come together as a country and channel our energies towards a successful Brexit deal that works for everyone in this country -- securing a new partnership with the EU which guarantees our long-term prosperity. That's what people voted for last June. That's what we will deliver. Now let's get to work," she said. Though May's Conservative Party emerged as the single largest party on a sensational election night, the impressive show by the Labour Party led by Jeremy Corbyn sent the British politics into turmoil, putting May in a complex situation ahead of the Brexit talks scheduled to start on June 19. The results -- a sort of turnaround in fortunes for both major parties -- have thrown that timetable into doubt. With results declared for nearly all of the 650 seats, Conservatives won 318 while the opposition Labour secured 262, leaving neither party anywhere close to the 326 seats required for an overall majority. The Tories will now have to rely on the DUP's 10 MPs to get things done. DUP leader Arlene Foster confirmed she will enter talks with May in an effort to pursue "stability" in Parliament, without giving further details on the conditions for the party's support. 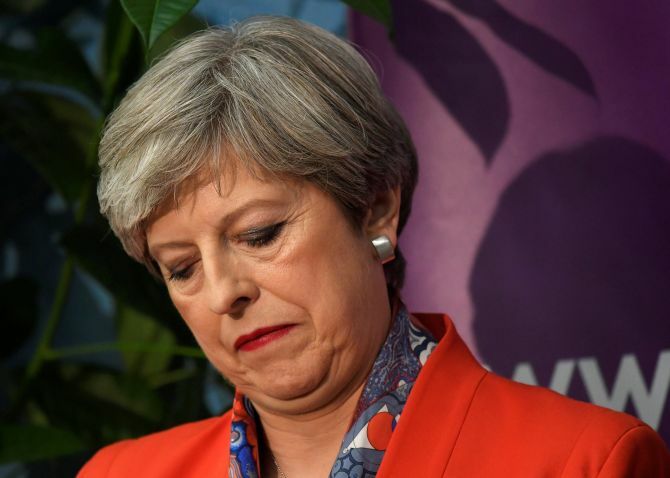 The shock defeat for Conservatives -- despite the pre-poll projections of a comfortable majority -- was seen by the British media as a "humiliation" for May to continue in her position. Corbyn, 68, may not have dislodged May in the polls but the Labour Party's strong showing prompted him to demand her resignation, saying she "lost votes, lost support and lost confidence" of the people. May in April had chosen to call the election three years ahead of the schedule to try to strengthen her hand in talks with the European Union to pull Britain out of the single market. The result threw the UK in a political turmoil amid increasing terror-related incidents. May won her Maidenhead seat in south-east England with 37,780 votes, but faced pressure to resign after losing her parliamentary majority she had before the election. The election had been classified as a "Brexit election" and the result is being seen as giving hope to the 48 per cent who had voted to remain in the EU in the June 2016 referendum and a rejection of May's so-called "hard Brexit" stance. EU's chief negotiator, Michel Barnier, indicated Brexit talks now be delayed from the date set for its start. Barnier tweeted the talks should begin only when the UK is "ready". Conceding to her dashed hopes of a landslide win, May earlier said: "My resolve is the same that as it has been. Whatever the results, the Conservative party will remain the party of stability." "At this time, the country needs a period of stability," and "it will be incumbent on us that we provide that period of stability," she said. Corbyn, beaming with hope, claimed on Twitter that the Labour party had "changed the face of British politics". "Politics has changed and this is people saying they have had quite enough... I am very proud of the results that are coming in and the vote for hope. The Prime Minister called the election because she wanted a mandate and the mandate is that she has lost seats," he said after his win from his seat at Islington North in north London. Labour picked up 29 seats and the Tories were on course to lose 13 seats. The Scottish National Party were down by 22, losing seats to the Tories, Labour and Liberal Democrats, in a major setback for Scottish First Minister Nicola Sturgeon. The turnout in the election is estimated at around 68.7 per cent -- up 2 per cent on the last general election. The Conservatives have won 44 per cent of the vote, Labour 41 per cent, the Liberal Democrats 8 per cent, UKIP 2 per cent and the Greens 2 per cent. The tally for the remaining parties stands as 35 MPs for SNP, Liberal Democrats have 12 MPs, up four from last time, and others at 13 MPs. Among some of the heavyweight losses of the night include that of former Liberal Democrat leader Nick Clegg losing his Sheffield Hallam stronghold to the Labour party, while fellow party colleague Vince Cable -- who had lost his seat in a shock result in 2015 -- has regained his Twickenham seat. The last hung Parliament result in the UK was in 2010, when David Cameron took over as PM and formed a Conservative-led coalition with the Liberal Democrats. The election, which has overturned all opinion poll projections of a strong Conservative party majority, recorded the highest turnout in 25 years at 68.7 per cent, with nearly 32 million of the 46.9 million registered voters casting their ballots. The number of votes is the highest since 33.6 million voted in 1992, when Conservative leader John Major made it four general election wins in a row for the Tories. How could those Brexit idiots win?